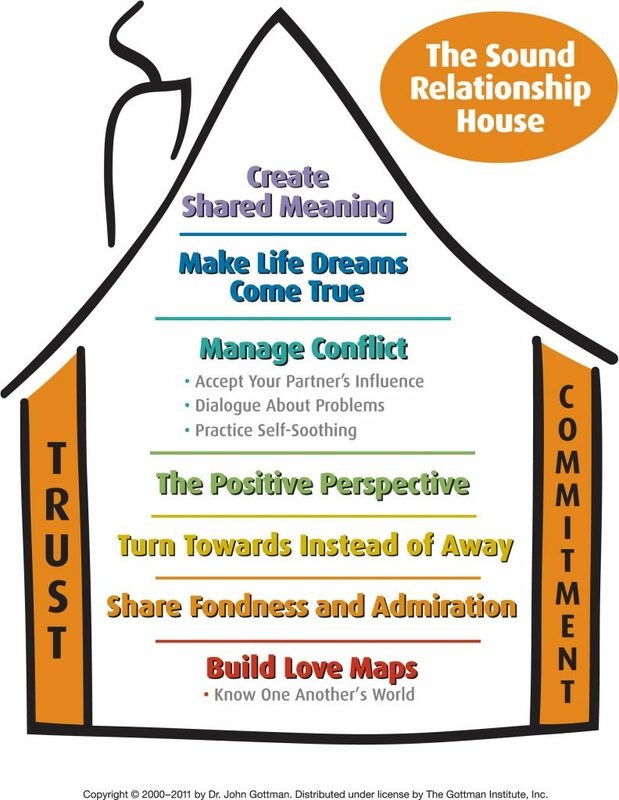 Last week, I introduced the concept of the Sound Relationship House, a metaphor for a healthy relationship. We talked about Love Maps, or to oversimplify it, knowing your partner, and how it is the ground floor. Working our way up this week, we’re looking at the next level, Fondness & Admiration, which we can also boil down to liking your partner and expressing it. You can already see how one level builds upon the next, right? Fondness and Admiration are key to any relationship. Why? The research found that any healthy relationship had about a 5:1 ratio of positive expressions to negative expressions. That means that happier couples shared an expression of positive affection, appreciation, fondness, or gratitude about their partner five times for every one time there was a negative expression. In couples headed for divorce, the ratio is about 0.8:1 positive to negative. If you think about these numbers in terms of an Emotional Bank Account, you can see how easy it would be to go bankrupt and not have enough resources to fuel your relationship. Can you think of admirable and adorable qualities in your partner? How often do you express them? When you’re telling stories about your past experiences together, do you remember them with fondness and share the positive qualities of your partner, or do you tend to focus on the missed needs and negative parts? Does this mean that in order to have a long-lasting and positive relationship, you can’t ever talk about negative things or complain about what is going on that you don’t like? No, of course not. Haim Ginott said it well; all emotions and all wishes are acceptable, but not all behavior may be acceptable. The research showed that while stable couples did express negativity, their expression of fondness and admiration regularly and often during their daily life helped them to operate in conflict from a place of positive sentiment override (or the Positive Perspective, which we’ll talk more about later). What does this mean for you? How close to that 5:1 ratio do you think that you are in your relationship? Are you on the lookout for flaws or behaviors to correct or are you actively pointing out what is going right and how your partner makes you happy and grateful? Stay tuned throughout the week for more ideas on how to make fondness and admiration a bigger part of your relationship to keep your emotional bank account flush. Follow me on Instagram and Facebook for more tips and ideas.